Carl and Chris at Huntington Beach pier. 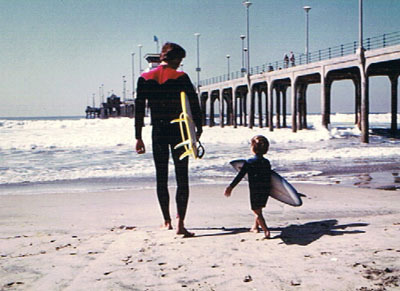 Carl Hayward was my friend, I grew up in downtown Huntington Beach in the 1960's and 1970's, actually I still live there. 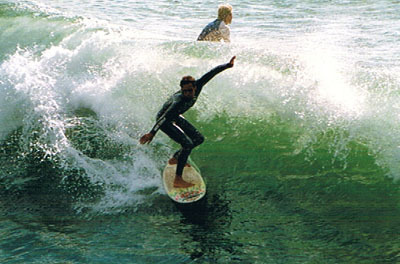 About the time I was 15 or 16, this gangly kid started showing up in the water on the South Side of Huntington Pier. I think he was from back East somewhere, Massachusetts or something. He had this accent that made his name sound like Cal instead of Carl. He, and later his brother Scott, became fixtures on the South Side. Carl wasn't anything like us then, save for the competitive spirit. We went to Huntington High, worked at one or the other of the surf shops, spent all of our free time surfing, and pretty much only associated with each other. Carl was a nice kid, a year or two younger than most of us, from God knows where. He spent all of his free time surfing too. Carl Hayward, south side HB pier. At first he was terrible, then he got pretty good, and then really good, and finally he could compete with anybody, anywhere. It wasn't any fun to jockey for waves with Carl. His long arms got him around a lot faster than mine could, which meant that more often than not, it was he that was in position and not me. But as ferocious of a competitor that Carl was in the water, he was that nice of a guy out of it. He was soft spoken, easy going, and friendly. Even when he was the best local surfer in town, you wouldn't have known it to talk to him. Carl decided that he was going to make surfboards for himself, so he went out and bought one of those steel storage sheds and set it up in his mom's backyard over in Pacific Sands. That was his first factory. 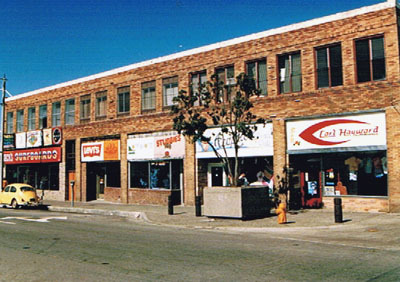 Carl Hayward Surfboards on Main St. Huntington Beach. Some of us got a pretty good laugh out of that. We'd tried making our own boards and found out that it's not anywhere near as easy as it looks. There are a few exceptions; Dean Cleary, and Bob Hurley to name a couple, who have mastered the craft. Carl was going to as well. What we didn't know was that artistic talent runs in his family. His mom, brother and sisters are all wonderful artisans. And they're all really nice people. Carl had a pretty good set of hands, too. He went to work for Pacific Surfboards, Dyno, and Sea Ski. Then he was running the Sea Ski factory. And finally he bought a factory and built a successful business of his own. He made a really good product, boards that worked well. During the latter time that I worked for Infinity Surfboards, I was having Carl shape some of my boards, even though he was a competitor. Whatever his focus was, Carl made a habit of staying at it until he was very good at it. He also made it his habit to not make a bunch of noise about himself, once he was good. He was a class guy. He was the kind of guy you hope your son grows up to be. Carl would go out of his way for you, even when it wasn't convenient for him. That's how you tell who your true friends are, the ones who just show up to help, without being asked. He and Dwight both left their business in the hands of a team rider and stood up for me the day that my Colleen and I got married. And when we moved into our new house, he just showed up and dug in, moving stuff. Nobody even knew he was coming. I'll be 50 years old soon; I've been a lot of places and known a lot of people since I left Infinity years ago. If, in that time, I've know a person of any description that was a better human being, I can't name that person now. If I have any regrets about my relationship with Carl it's that I didn't elbow my way into Hurley's factory to say hi more often, on my way through the School District. Carl always made time to talk even though I know he was busy, and he was always genuinely glad to see me. I don't think he ever forgot a friend. God, apparently took notice of what I've long known, that Carl represented the best in us. However many Carl Haywards that God sees fit to throw our way, the world can use them. His rare brand of integrity and chivalrous approach to life was a breath of fresh air. He was a truly golden individual.